Use the form created on the previous tutorial. A TButton to stop stop or pause playing the audio file. Change the name of the two button to PlayButton and StopPlayButton. 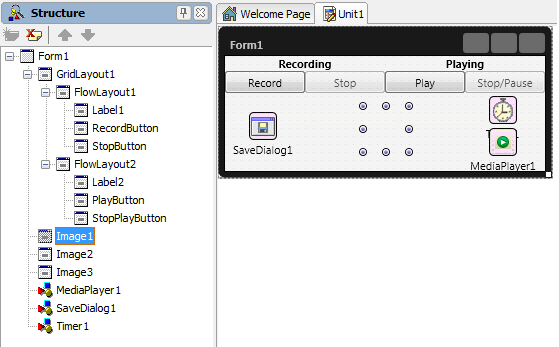 Set the StopPlayButton as being disable by setting the Enable property of the button to False. Add two more TImage to the form. Set the TImage.Bitmap property of each TImage to images that are suggestive for the play and pausing processes. The usual icon for playing process is an arrow and for pausing are two parallel vertical bars. Set all images on the same position and with the same sizes. The tree images are total superimposed. Add a TTimer to the form. Set it as enable. To play a video file using a TMediaPlayer, set the FileName. 3. Double-click the timer to attach OnTimer event handlers to it. The timer is used to manipulate the images opacities during the playing process. 4. Press the Stop button to stop recording. If the recording is not finalized by calling StopCapture method, the saved file will not be properly decoded when will be played by a media player.